The single most popular thing in all of America is football. Specifically, the NFL. 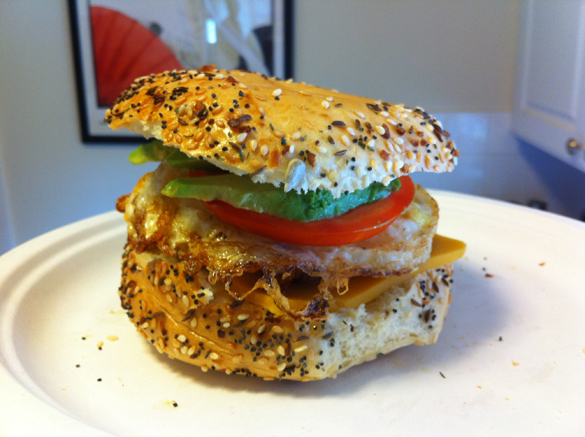 In honor of the first Sunday of the regular football season, the day was spent watching the sport on television while making an assortment of bagel egg sandwiches. You will recall that I have touted the glory of sandwiches made on bagels, and this was a great opportunity to stretch that experience out over two meals while watching some sports. 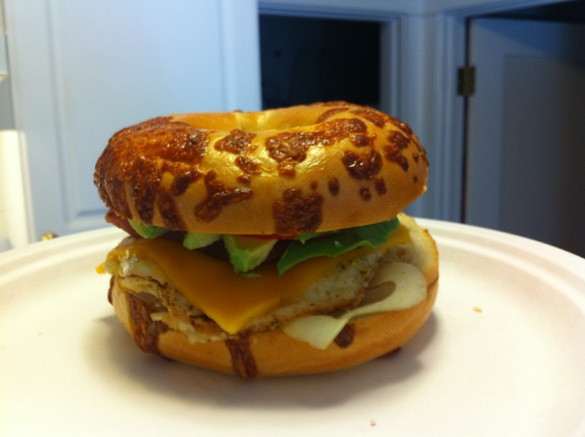 My first attempt, pictured above, was sausage and egg on a cheese bagel. Chicken apple sausage was cut lengthwise, then again cut in half and pan-fried. Eggs were fried, white onions seared in a pan, and combined on the bagel along with fresh avocado, medium cheddar cheese, and tomato. The end result, although of a pleasing taste, ended up being frustrating to eat. The toughness of the sausage casing and the shape and positioning of the quartered sausage caused no end of filling creep. The sandwich nearly fell apart in my hands as I struggled to hold it together. A lovely sandwich completely undone by the method in which I chose to include the sausage. Had I the opportunity to do this over, I would have cut the sausage into much smaller half-circles or cubes, which I would have then dropped into the egg as it finished frying in the pan. Hindsight, however, is 20/20, and I was left with a good-tasting but frustrating sandwich. The second sandwich was nearly identical, served on an “everything” bagel, but with one all-important difference: instead of sausage, freshly-prepared bacon was included. This, my friends, was a road well-traveled, but made all the difference. One cannot deny the allure of bacon, but it is with good reason. The bacon was the perfect meat for this sandwich. It added smokiness, saltiness, and crunch, but more importantly, it yielded perfectly to each bite, adding substance without resistance. A sandwich that holds together is a good sandwich, and sometimes it all comes down to what best makes the center hold. As you can imagine, this is especially true of sandwiches prepared upon a bagel. This entry was posted in General Sandwich Discussion, Sandwich Reviews and tagged Breakfast, Reviews by Bill, Sandwiches I Have Eaten, Sandwiches I Have Made, Sausage by bengrimm. Bookmark the permalink.